An alternative title for this page: ‘Airspeed, part 3′. In part one we visited two places where Nevil Shute, one of the founders of Airspeed, lived in the early 1930s. In part two, places of work. So, you might say, we could stick a plaque on one of the other buildings and get on with demolishing this ‘old eyesore in Piccadilly’. As is likely to happen now the council have put it up for sale. A more forward-thinking, 21st century approach would be to retain the shell of the building and refit and extend it, and use it for the new and exciting industries of this period, just as it was used for a brave new venture in the 1930s. Media and creative centre, anyone? 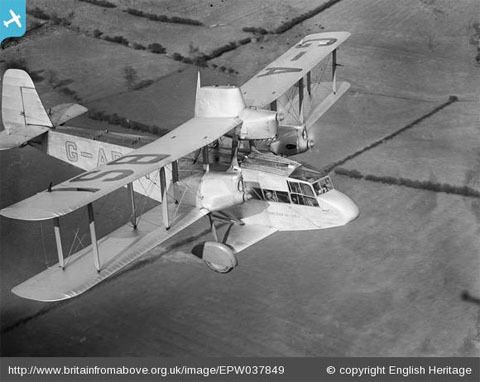 Its full name is the Airspeed AS4 Ferry G-ABSI ‘Youth of Britain II’. 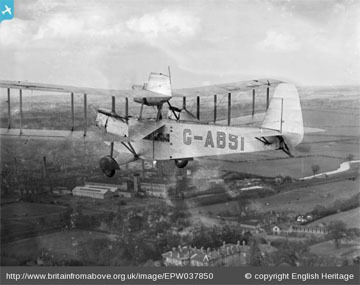 Pictured in flight in 1932. I’m hoping that these pages inspire the Youth of Britain today — or at least the youth of York — and hopefully older people too, not to see the ‘old bus garage’ on Piccadilly as just an old wreck in need of demolition, but as something the city should make all efforts to save and reuse somehow. In his comments on the city’s attitude to aviation Shute called York ‘rather backward’. What we’re rather backward at now is in appreciating our 20th century history and in particular the smaller but significant parts of its industrial heritage. In that respect I think other cities are far more advanced. York’s ‘visions’ aren’t that visionary if they don’t embrace its 20th century heritage. Interest in this area is growing. I’ve seen this in the decade I’ve been compiling the pages for this website. This building has a story to tell and perhaps in another city with a more enlightened appreciation of industrial heritage it would also have a future. 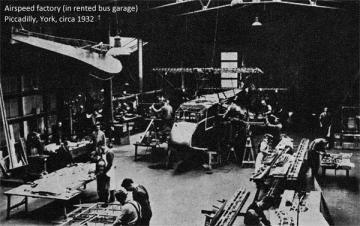 And this isn’t just our history, here in York, but part of the UK’s aviation history, in our care. The council has just put the building on the market, so this is an important time in its long life. Demolition seems likely as it seems to have failed to capture the public imagination. I’m trying to do my small bit to change that. Clearly it would need some work to be useful again. Modern dreams of ‘flight’ could be made here, in the new industries perhaps. 21st century entrepreneurs making new businesses in the place where Shute looked down on the expanding workforce building the Airspeed vision 80 years ago. Or perhaps it could go back to being a bus garage, for those impressive looking new electric buses. Like the ones built at Optare in Sherburn, from where the Airspeed planes took flight back then. Actually, they’re serious ideas. This should be reused, refurbished, as a workplace, not another block of flats. Piccadilly was created as a through route, all about transport and trade. Mainly about transport. For much of its life it had many garages. They all went, inevitable. This is its last architectural remnant connecting it to the possibilities offered by early 20th century transport before it got all choked up and busy. Its proportions and functional appearance remind us of that. It was built in the early 1920s for buses and then was used to make aircraft. It needs to be here to tell that story. If the City of York considers it acceptable to erase this building from the landscape then I know we really have lost the plot. There’s a lot of misinformation out there, and a lot of ignorance about this building’s history, and a lot of people who spell Nevil Shute’s name ‘Neville’. I’m hoping that we, dear readers, can change that, and spread the word. Please link to here if you do. It took days to compile these pages on Airspeed (see tag: Airspeed, three pages in this batch) and I did so because I’ve cared, for years, about this building in Piccadilly. I hope you do too now, if you didn’t before. There’s much more to say, but I can’t fit it all in. Please feel free to add further information via the comments below. Time to fly, thanks for reading. 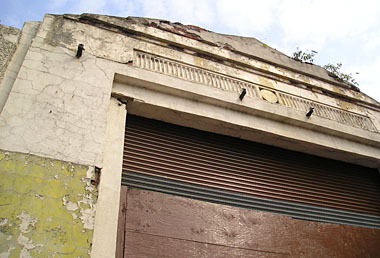 I am very grateful to know this story and agree the Reynards building needs urgent TLC. Oxfords after the company move to Oxfordshire. As a lover of transport past and future, these oases from the past should be ‘treasured’ rather than erased. My brother Lance hired a Hillman car from the Garage in Piccadilly in the year 1938.